So you want to run your own bakery? That's great! If you're a little confused then I can help you out, just keep reading and I'm sure your questions will be answered. There are several important aspects to running a successful bakery: Cooking Food, Serving Food, Keeping Customers Happy, and Customizing Your bakery. Please note that identical food types (blue cupcakes on two ovens, for example) will INITIALLY take up two serving counters, but if your serving counters are becoming full then your chef will combine your identical dishes to make room for new food. You can keep your customers happy by having empty seats for them to sit in and prepared food for them to eat. If there is no room for a customer to sit, then they will eventually become frustrated and leave the bakery. If there is no food for them to eat, then they will eventually become frustrated and leave the bakery. Make sure to have plenty of food and plenty of seats and tables waiting for potential customers - remember that happy customers will attract even more customers and that's just what you want! You can customize your bakery in any way that you like - it can be strictly functional with only tables, chairs, ovens, and serving counters, it can be purely decorative with no functional items, or it can be anywhere in between. 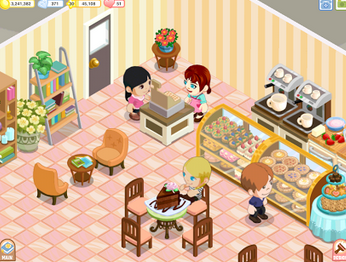 To find items to place in your bakery, open the store by tapping on the hammer in the lower right corner of the main screen. That should be enough to get you started and running a healthy and successful bakery! If you still have questions try reading the section below this where I will answer more specific questions that are commonly asked. The Community is composed of everyone who plays Bakery Story. You can help members of the Community by leaving them tips or writing an ecouraging comment on their walls. To find members of the Community, open the Social page from the Main Menu and tap the Community tab. From here you can view a list of several Community members and go to their bakeries by tapping the Visit button. Tipping another player will grant them bonus experience and coins and will increase your Star Rating. Your Star Rating is displayed at the bottom of the bakery you are visiting and can range from 0 stars to a full 4 stars. A higher Star Rating increases your chances of appearing at the top of the Community list. Keep in mind that you can only tip a Community member's bakery 3 times each day, so if you want to get a 4 Star Rating you will need to help several Community members or Neighbors (explained in the Playing With Friends section). To give a Gift to another player, you must first add them as a Neighbor You can then send a Gift either directly through the Neighbors page by tapping the Gift button next to their name or by visiting a Neighbor's bakery and then tapping the Gift icon on the right side of the screen. Food that finishes cooking but isn't moved to the serving counter in time will eventually spoil. The amount of time it takes for a dish to spoil is approximately the amount of time it takes for that dish to cook, so if a dish takes 1 day to cook, once it finishes cooking you have approximately 1 more day to serve it before it spoils. Why Doesn't Espresso or Some Dishes Appear On My Oven? Ovens and drink mixers each make different types of dishes (for example, ovens can only make baked food). If you want to find different dishes, try to think about which of these appliances it would be cooked on and you should find it there. 1. There are no prepared dishes for the customers to eat or drink. 2. There is not enough sitting room in your bakery (sitting room means an empty chair facing an empty table)..
What is the Holiday Box? Opening the Holiday Box gives you a chance to obtain items you can't find anywhere else! Tap "Design" in the home screen, then select the 8th tab (Expand). How Do I Expand My Bakery? Tap "Design" in the home screen, then select the 8th tab (Expand). How Do I Move Items In My Bakery? Items can be moved by opening the Design menu. Once you open the Design menu, tap on the item in your bakery that you would like to move to select it, then drag that item to the new location you would like to place it. Once you place the item in the new location, you will need to tap it again to confirm its new placement. If you try to place an item in a location that is already occupied by anotheer item, then the action will fail and it will return to its original location. When you store an item, receive a gift, or receive a special item through the Magic Box, it is placed in the appropriate category inside of the Design menu. For example, if you store a table, it will be placed in the Tables category. To place it in your bakery again simply open that category and tap or drag the item into your bakery. All stored items are placed in the front of their categories and have a marker in the lower right corner along with a number signifying how many of that item you have stored. How Do I Sell Items In My Bakery? If you would like to sell an item in your bakery, open the Design menu and then tap on the item you want to sell. On the right side of the screen you will see three icons: the price tag icon (marked as Sell) allows you to sell items from your bakery for a small percentage of the initial cost of that item. Tap on this icon and you will be asked to confirm your decision - doing so will sell the item. Please remember that all decisions to sell items are final and that sold items cannot be recovered.